What Serena Williams is to the Grand Slam, what the John Wooden UCLA basketball teams were to the NCAA tournament, and what Magic Johnson to the NBA finals — that is what Granada Hills Charter High School is to the rarified world of the United States Academic Decathlon: an iconic L.A. powerhouse that could soon run out of room in its trophy case. With its victory at the 2017 championship in Madison, Wisconsin, in April, the program claimed an unprecedented sixth title in seven years. The event, considered one of the most grueling high school academic challenges, tests nine-member teams from around the country in subjects ranging from math to music to social science to speech. To even reach the final round, a team must proceed through a series of regional and state competitions. What’s more, as the birthplace of the decathlon and home to its past 15 winners, California is known as the proving ground of great squads. Judging from its homecoming reception, to say nothing of local media, Granada Hills stands as the undisputed ruler of the state. Officials from the Los Angeles Unified School District and the city council welcomed the team back with congratulatory speeches, while the school band hailed them with bagpipes and cheerleaders twirled. Among administrators, the mood could best be described as giddy. Uncommon devotion and excellent coaching are two of the program’s strengths, but it benefits from other advantages as well. Although decathlon teams are grouped into three divisions based on size, big schools headline the contest, and Granada Hills’ nearly 4,500 students make it the largest charter in the country. Founded as a part of LAUSD nearly 60 years ago, it reportedly boasted the largest student body in the country in 1970. Though its most famous alumni are athletes (gridiron legend John Elway graduated in 1979, and Milwaukee Brewers MVP Ryan Braun followed a few decades later), the school is also considered one of the highest-performing in California. Bauer successfully campaigned to win charter status for Granada Hills over a decade ago, disappointed with the district’s decision to veto the school’s strict attendance policy. That decision crystallized a back-and-forth struggle in the city between charter advocates, who celebrate the independent schools with the same enthusiasm that Granada Hills pours on its decathletes, and the district’s school board, which has been more wary. 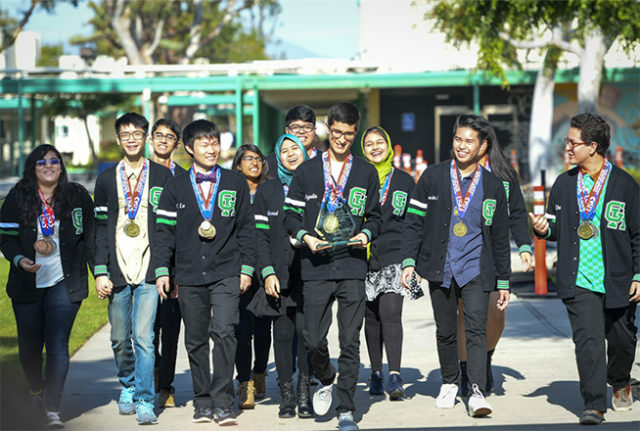 Though he has never looked back since decoupling from LAUSD, Bauer feels that Granada Hills — and perhaps especially its Academic Decathlon program — still benefits from playing in the same academic sandbox as the district. In an interview with The 74, three Granada Hills decathletes described their intramural jockeying as fierce but friendly. Those relationships are nurtured by the coaches, who see them as a key to mastering the decathlon’s unique setup. Each team must include students with varying academic records: three each from the “Honors” (3.75 GPA and above), “Scholastic” (3.00–3.74), and “Varsity” (2.99 and below) designations. That requirement prevents schools from cherry-picking their top pupils and makes collaboration imperative; Honors students give their Varsity teammates an example to follow, while seniors mentor younger students in the skills necessary to win. Jordan, Aisha, and Peter are all seniors. Along with some of their teammates, they’re now enjoying their final week of high school — winding down the academic year, but also finalizing vacation itineraries and getting ready for college. Aisha wants to major in English, Peter plans to study computer science, and Jordan has his eye on an architecture degree. Soon, the demands of the decathlon, including its 12 hours of daily preparation, will be a memory. Not for Sturtevant, however. As soon as this year’s competition ended, he and his fellow coaches began assembling research materials for the 2017–18 decathlon topic, a study of the art, culture, and economics of Africa. And even as he bade farewell to his departing champions, recruitment had already started for next year’s team.